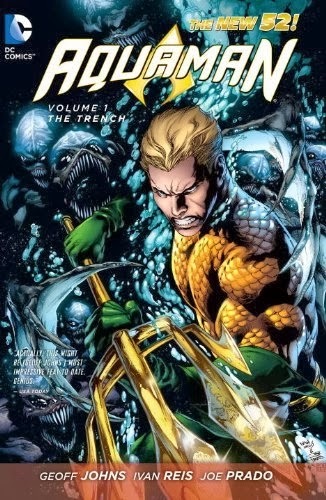 "AQUAMAN has renounced the throne of Atlantis – but now, from a forgotten corner of the ocean emerges…THE TRENCH! • Collecting AQUAMAN #1-6!" Purchased the Kindle edition during a half-off sale. I was one of those nerds who liked Aquaman in the 70s, as a kid, but I never really got into him much after that so I was really looking forward to this one, especially with Geoff Johns at the helm. I really loved it. This one is going to be added to my lists! Excellent story of some vicious deep-water humanoid/marine life-forms that rise above their depths in search of one thing, food, meat - that is. A great story, scary looking bad guys, some empathy going both ways and a story that concludes in this volume but leaves a trace element behind to start the next story arc. Aquaman is a funny guy; I like him. The book has plenty of humour at his expense as he's talked about as "nobodies favourite superhero". Well, I'm joining his fan club, he's cute, ripped, blond and I like orange! LOL Aquaman's background is ventured into with flashbacks of him and his father, Mr. Shin is still around and we learn his background with Arthur and most of all Arthur and Mera's relationship is explained enough that we get where they've been. Mera is awesome. Probably my favourite female I've met in the New 52 so far. She is 100% female, feminine, loves her man with passion *and* can kick but just as good as he can, only she doesn't need to have a very good reason to .... so don't mess with Mera! 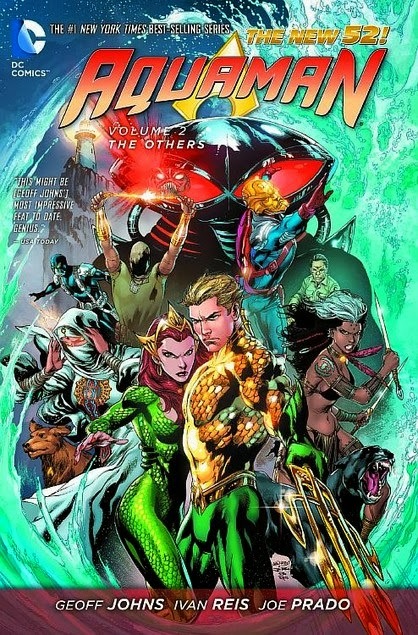 "Aquaman joins up with his old teammates, The Others, to learn who destroyed Atlantis! But as they seek the truth, Black Manta is stalking them all—and Mera learns some dark truths about Aquaman!